So I'm finally back at it- into the challenges. This is my first this month. This is the scrapping clearly August mood board. Gorgeous colours, and a little out of the ordinary for me- I don't use purples and pinks much with my boys. 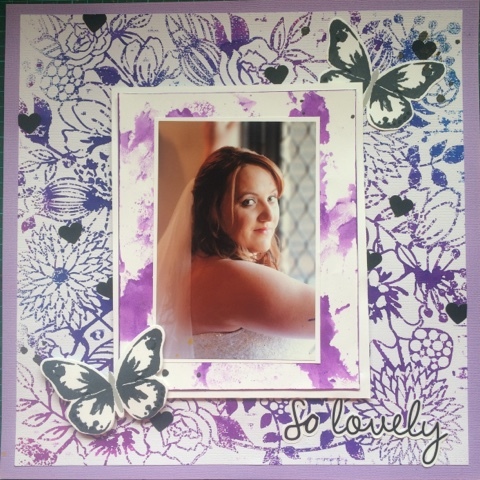 But purple is most def my sisters colour so I decided to make a start on her wedding album. I had fun with my dyelysions- just gorgeous colours and blend beautifully. And I use a dear Lizzy stencil that I misted then transferd the image onto cards tick. I love this pic of her. One of my faves. Stunning!!! The background is amazing!!!! !Thanks for playing along with Scrappingclearly.